For those of you in the know, no need to introduce Circoloco, for all the others, it just happens to be the craziest party of the last 10 years of Ibiza. When Circoloco started, it was the Monday morning after-party spot for the Ibiza party crowd at the legendary DC-10 club. Over the years, this has developed into an all day party on Mondays that even stretched well into the Tuesday morning hours making it the reference underground party in Ibiza till today. This year’s Halloween party will be even more particular since DC-10 has been closed all summer for the first time ever and most aficionados have been going cold turkey and feeling the loss of their favorite party spot. You may be able to catch Circoloco at their only event @ DC-10 on October 6th but let’s be realistic, most New Yorkers will not be traveling to Ibiza this fall and that’s why October 31st will be the date to see it all, do it all, and not remember a thing! The line-up will be completely different from last session. 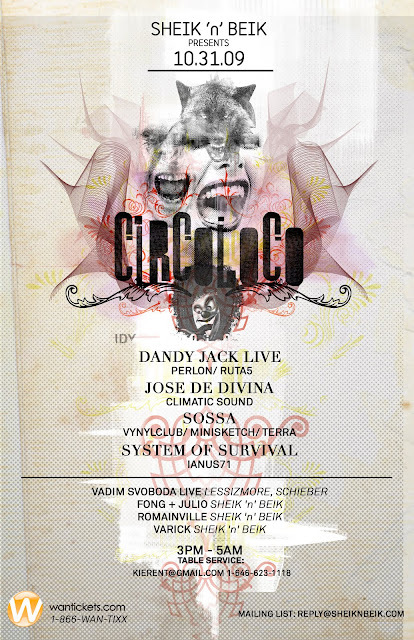 Circoloco residents will include old timers Jose de Divina, System of Survival and a live set by Dandy Jack, as well as an appearance by one of their newer residents Sossa who mixed one of the sets for the 10-year anniversary compilation last year. To complement all this talent, Sheik ‘n’ Beik will be adding its four residents FoNG + Julio, RomainviLLe and Varick with a special live performance and return to New York from Paris, local superstar Vadim Svoboda. With such a vast line-up of craziness, the only appropriate schedule that would live up to the Circoloco experience is a 14-hour bedlam in the heart of Williamsburg. Since our location has an outdoor area, we will be starting the festivities at 3PM rain or shine and continuing till 5AM so rest assured, food will be available on location with our special Halloween menu. You may purchase tickets online at www.wantickets.com till 1PM on the day of the party or at the door.